Address from Chairman, Breaffy GAA Club. As Chairman of Breaffy GAA Club it gives me great pleasure to welcome you all to Breaffy this evening for the final of the West Mayo Kelly Cup tournament. I welcome in a very special way Stephen Kelly who has always made himself available for the presentation of the cup to the winning team. 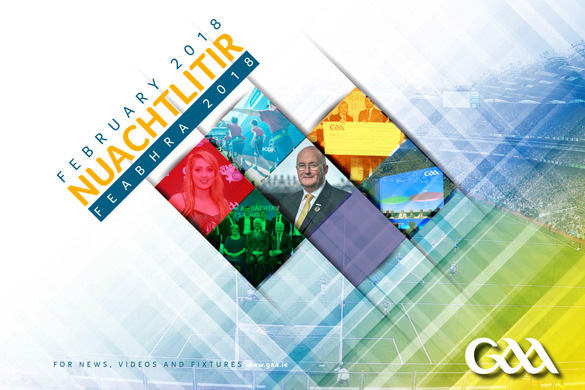 I welcome both teams and supporters especially our great rivals Ballintubber, those two teams have locked horns many times over the years and they have treated us to some wonderful sporting occasions in Breaffy, Ballyheane, Ballintubber and Clogher. I welcome John Gibbons, Chairman of West Mayo GAA Board and his fellow officers. It is hard to believe that its forty years since that awful tragedy befell the Kelly family and our community, for those of us who are of a certain vintage will never forget the Friday morning when news broke of the tragic death following a car accident of Peter and Gerard Kelly the previous night while on their way to a dance in Belcarra. The two brothers were on vacation with their family from the U.S. when the accident happened. Forty years on we are again mourning the death of another great Breaffy player, David Gavin who lost his life in a drowning accident in Canada on June 30th last. His body has yet to be recovered. I would like to take this opportunity to thank the many clubs here in Mayo and beyond who have donated very generously to fund the recovery process of David’s body. I look forward to another great game and I’m sure both teams will treat us to another outstanding final. Breaffy GAA Club have compiled this historical summary of the Kelly Memorial Trophy on the occasion of the 2017 final in memory of Gerry & Peter Kelly, the men whom the trophy is dedicated to, in recognition of the Gaels of Philadelphia who donated the original trophy and all those who played in and administrated the competition since 1977. What was always been referred to in local GAA circles as the Kelly Cup was obviously a misnomer as from the commencement of the competition in 1977 until 2003, the winners received a massive four tiered 3foot high trophy, far removed from the normal perception of a cup. 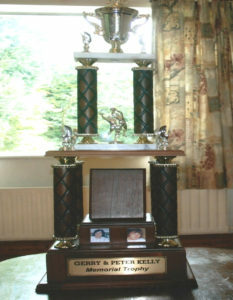 In 2003 the West Mayo Board replaced the original trophy with a conventional cup which still commemorating the Kelly Brothers. Today’s opponents in the Kelly Cup brings together two clubs who have regularly graced this competition. With no competition played in 1979, this will see the fortieth playing of the final. Ironically, this is the only the second time that Breaffy and Ballintubber met in the final although they have participating in 24 of those finals.. Breaffy have qualified for 12 finals winning 6 while Ballintubber have triumphed 4 times from the 13 occasions they reached the final. The majority of people attending or indeed playing in this West Mayo GAA competition, probably know very little if anything at all of its history. Therefore, it is appropriate that some forty years later, the story associated with the trophy itself and some interesting data associated with the competition, and especially Breaffy and Ballintubber’s involvement in same, should be recalled once again. Normally, a GAA trophy or cup is dedicated to a former GAA activist or some well-known individual but the original Kelly Memorial Trophy was dedicated to the memory of two men, Gerard and Peter Kelly, of Corheens, Breaffy who had close affinity with the Breaffy Club prior to their emigration to Philadelphia where they joined their sister Nancy and where they became active in the GAA in the City of Brotherly Love. On August 1st 1975, while home on holidays from the United States, the aforementioned men, Peter and Gerry Kelly, were tragically killed in a road traffic accident at Lisaniska, Belcarra, Castlebar. Injured in the accident was their younger brother Stephen, who was one of Breaffy’s star forwards of the 1970s & 80s and who was at left half forward on the All Ireland winning Mayo Vocational team of 1971. They were also survived by their parents Patrick and Bridget Kelly, sister Nancy and brothers Vincent, who was involved with the Breaffy Junior winning team of 1966 while another brother, Charlie (RIP 2002) also played with Breaffy at underage level. As a consequence of the fatalities, GAA members and supporters in Philadelphia presented this magnificent trophy to the Breaffy Club in memory of the brothers. The Breaffy Club subsequently decided to present the trophy to the West Mayo Board to be awarded to the winner of the Winter League of 1977. The competition was originally confined to Junior teams only, with teams divided in two sections, appropriately enough called the ‘Inland’ and ‘Seaboard’ sections. Matches were to be played in early spring with sectional winners and opposite runners-up meeting in the semi-finals and the respective winners competing for the ultimate prize which was intended to be played by Easter. Unfortunately, the best laid plans to finish the competition before Easter did not materialise as the 1977 final did not take place until the last Sunday in November. Suitably enough, Breaffy were the initial winners defeating Burrishoole on a score of 3goals to 1goal.6points in a final which was played in Islandeady with Michael Devaney, Castlebar as referee. Stephen Kelly appropriately enough got the opening scores, pointing in the first minute and then hitting the net from a penalty shortly afterwards. The massive new trophy was presented to the Breaffy captain, Seamus Conroy by the Chairman of the West Board, Breaffy’s own Tommy Lyons. BURRISHOOLE:- Larry McGovern, Cormac Loftus, Christy Loftus (1gl), C Horan, John McManamon, Peter Burke, Hugh Cannon, Pat O’Malley, Davey Sweeney (3pts), Francis Chambers, Padraic McCormack (1pt), Michael Grady (1pt), John Nolan, John O’Malley, John Daly (1pt). Sub:- James Doherty for John Daly. In the second year of the competition, 1978, only four teams, Breaffy, Burrishoole, Castlebar and Tourmakeady competed in the Kelly Cup with Tourmakeady defeating Breaffy in the final. As previously stated, worse was to follow as this new West Mayo trophy was not competed for at all in 1979. But, ironically enough, a Memorial Trophy in memory of Gerard and Peter Kelly was played for during that year but far from the shores of West Mayo. This occurred in Philadelphia itself where the local GAA club donated another trophy in memory of the Kelly brothers on the occasion of a visit by the touring Claremorris team in October of that year. The locals defeated Claremorris on a score of 4gls.16pts to 3gls 17pts. Indeed, that Kelly Memorial trophy was competed for again the following October when once again, another touring Mayo club, this time Ballina were defeated by the locals on a score of 4gls.11pts to 1goal 15pts. Different innovations have been tried to maintain enthusiasm among the clubs. Due to some negative headlines from inside and outside the West Board regarding the competition, the West Board felt compelled to act accordingly and so, opted for a knock-out competition in the Millennium year of 2000 with all matches due to be played during Summer and in mid-week. Burrishoole, the 1999 winners reached the final again in 2000 but lost to Breaffy in the decider but would come back again to retain the trophy in 2001 and 2002. The 2002 victory ensured that Burrishoole were the last winners of the original Kelly Memorial Trophy as in 2003 the West Board donated a new cup which is still dedicated to the memory of Gerard & Peter Kelly. For all the aforementioned criticism that was levelled at the competition by the end of the 20th century, it is quite ironic that in its forty years existence, the result of the 2000 final is the only one unavailable in the local media. In the following year of 2010, Ballintubber were defeated in the final by Burrishoole but to get to that final they had an interesting semi-final clash with Westport. “ When is a Draw not a Draw ? ” was the headline on one paper which also showed two different but genuine results for the same match, Division 1 League – Westport 1.9; Ballintubber 1.9; Kelly Cup semi-final – Westport 1.9pts Ballintubber 1.12pts. Rather unusual but an innovative solution had to be devised for an awkward situation. Ballintubber and Westport had agreed that their Division 1 League game would also count as the semi-final of the Kelly Cup as time (and West Board) would not allow them to postpone the semi-final. Grand in theory but as the League match ended in a draw at 1gl.9pts each, an obvious dilemma arose now – no winner to proceed to the Kelly Cup final. 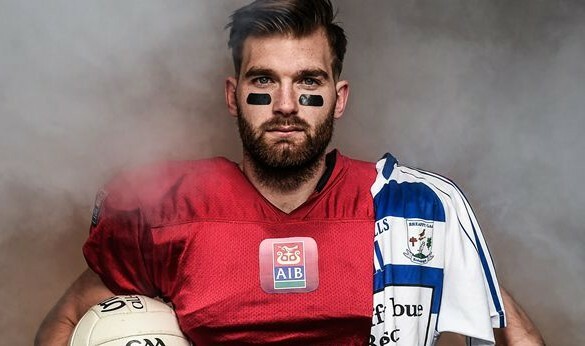 So an amicable solution was reached –both teams agreed to play another 30 minutes with Ballintubber getting the extra points needed to proceed to the final. 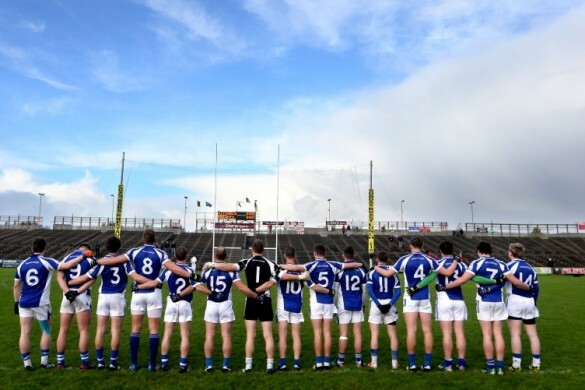 Perhaps not contentious but certainly regrettable is the fact that probably none of the present day county stars will be playing in this year’s final. Competitions like the Kelly Cup needs the O’Sheas, the O’Connors, the Hennellys and the Dillons to be playing to sustain the interest of supporters. Alas ‘Big Brother’ doesn’t see the overall value of these secondary competitions. Indeed relevant to above is the fact that on a wet and miserable Sunday in February 2007, a certain Aidan O’Shea made his senior debut for Breaffy in a Kelly Cup match played in Ballyheane. Aidan and the ageless Declan Jennings (a man who was at least twice his age then) manned the midfield positions for Breaffy that day. Speaking of a generational span, it is worth recalling for posterity sake that another ageless Jennings, this time Gerry has played in his 26th Kelly Cup competition having being on the losing Breaffy side in the 1992 final. Indeed, it would be remiss not to include another ‘ageless’ Breaffy player , Eddie Conroy who has also played in the Kelly Cup for the past 20 years, a player who has given remarkable and loyal service to the Breaffy club since his debut with the Blue & White in 1997. After winning the initial competition in 1977, Breaffy second victory was in 1981 when they defeated Kilmeena by 1gl.6pts to 0.7pts. Breaffy Team:- John McTigue, Noel Tuffy, Liam Bourke, Willie Lavelle, Padraic Walsh, Seamus Conroy, P.J.Clarke; John Bourke & Ivan Ryan; Frank Lavelle (1gls.1pt) Henry Joyce (1pt), Seamus Tuohy, Stephen Kelly (1gl.1pt) Gerry Hughes (2pts) Michael Finnerty (1pt). Sub- Vincent McDonagh. 1985 was the only previous time this year’s contestants met in a final with Breaffy winning on a score of 1goal.5pts to Ballintubber’s 3pts with Gerry Hughes getting the crucial goal. Breaffy Team:- Tom Tuohy, Noel Tuffy, Seamus Conroy, Tommy Basquill, Sean Skeffington (1pt), Pat Tonra, P.J.Clarke; Michael Finnerty & Tom Cunniffe; Eugene Caulfield (2pts), Ivan Ryan, Padraic Walsh, Vincent McDonagh, Gerry Hughes (1gl), Stephen Kelly (Capt – 1pt); Sub-Jimmy Walsh for V McDonagh. (Pat Tonra created a bit of history in this final by winning a Kelly Cup medal with Breaffy having already done likewise with Parke). In 1997 Balla were once again the victors defeating Breaffy by 1.13pts to 1.10pts. The Breaffy team on this occasion was:- Ollie Cunningham, Sean McCormack, Sean Grealis, Kevin Scahill, David Cusack, Mark Fahey, Paul Jennings. Robert Fahey & Tom Cuniffe. Kenneth Walshe, Pat O’Brien, Charlie Lavelle, Declan Jennings, Kieran Doyle, Danny Fahey. Subs used :- G Conway, Pat Tonra, Vincent McDonagh. Three years later, Breaffy regained the trophy when defeating Burrishoole in a final played on the 19th of November. Obviously the plan to play the Millennium competition during Summer time on Wednesday nights in a knock-out format didn’t materialise. Neither did the planned publicity of the competition as there are no record to hand of either the score or the players participating in the final. Breaffy Panel of 2000; -Ollie Cunningham, David Sheridan, Barry.Jordan, Sean McCormack, Gerry Jennings, Conrad Coghill, James McDonnell, Pat O’Brien, Colm Lyons. Eddie Conroy, Sean Grealis, Cormac Reilly, Marty McNicholas, Declan Jennings, Matthew Conroy, Robert Fahey, Kieran Doyle, Kevin Scahill, David Cusack, Kenneth Walshe and Paul Jennings. After their 2000 victory, Breaffy lost in 2005 and 2012 before regaining the title in 2013 and again in 2016 when defeating Westport by 2gls. 16pts to 0.6pts:- Last year’s team was:- Evan Mulgrew, Dylan Cannon, David Gavin, Colm Dravins, Colm Kelly, Miceál Jennings,(1gl-pen), Gerry Jennings, , Matthew Ruane (2pts) and Brian Howley. Robert Fadden (1gl), Peter Dravins, Eddie Conroy (1pt), Tommy O’Reilly (Capt -3pts), Liam Irwin (6pts), Gareth Dunne (2pts). Subs- Kevin Curry (2pts) for Brian Howley (b.card); Colm Jordan for Dylan Cannon, Conor Carter for Gareth Dunne, Gary Walsh for Matthew Ruane, Daire Morrin for Colm Dravins, Keith Mulchrone for Gerry Jennings; (The Kelly Cup was presented to the Breaffy captain, Tommy Reilly by the same Stephen Kelly who scored the opening point in the initial final in 1977). Kelly Memorial Trophy – Ballintubber’s Involvement. 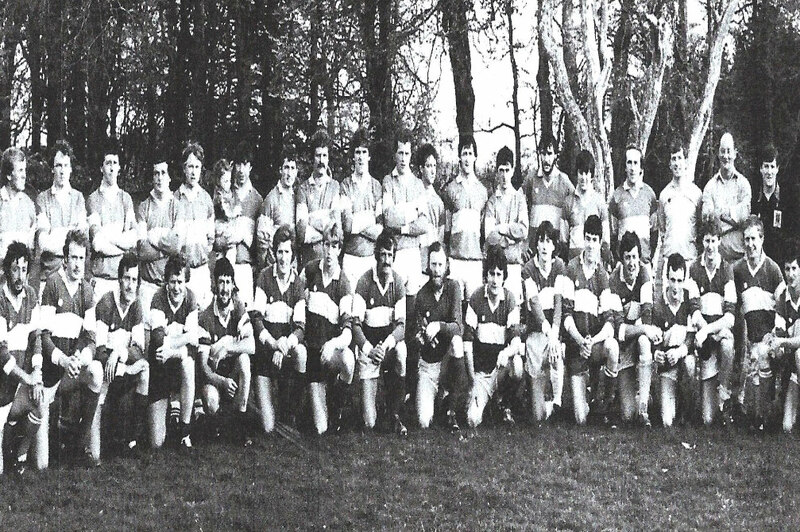 Ballintubber’s first of 13 appearances in the final was in 1982 when losing to Parke by 1gl.6pts to 0.7pts. Their team was :- J. Heneghan, M. Heneghan, M. Conroy, T. Lally, G Dillon, J Connor, P. Connor, M. Brennan, J. Walsh, G. Feeney, M. Geraghty, J. McGing, J. Lally, J. Larkin. Between 1984 and 1989 Ballintubber contested six Kelly Cup finals in a row, losing to Islandeady and Breaffy in 1984 & 1985 while defeating Burrishoole in the following two finals thereby in 1987 becoming the first team to retain the Kelly Cup. They won that year’s trophy after extra time in a replayed match which was reported as involving “a number of some unsavoury incidents”. The 1987 Ballintubber Team was:- M McGurren,Tom Blake, M.Brennan (Capt), G Dillon, P McCarthy, J.F.Sheridan, J. Moran. J Horan, J Sheridan (0.1pt), J McGing (0.6-pts), J. Murphy. J.Concannon (0.2pts), M. Kerrigan, S Burke, J. Larkin. Subs:- Jimmy Lally (1gl.2pts) for M. Kerrigan; J. Heneghan for M. Brennan; M. Dolan for J Larkin. In 1988, these two protagonists were back in the final again for the third year in a row with Burrishoole getting revenge on the Abbeysiders by the narrowest of margins. 7pts to 6pts. The following year saw Ballintubber win their third title when defeating Balla on a scoreline of 4gls.8pts to 1gl.7pts. Considering their recent successes, it is hard to imagine now that it took another 25 years before Ballintubber claimed the Kelly Cup again. In those intervening years, they were beaten in five finals including 1998 when losing to Westport by 1gl.13pts to 1gl.8pts. Their team that day was:- P Corbett, P Lally, M. Derrig, D. Hayes, F.Conroy, T. Duffy, A. Staunton, P.J.Derrig (1pt), T. Earley, M. McGrath, J.oran (1gl.4pts), K.Lally, F.Glynn, T.Prendergast (1pt), C. Staunton (1pt); Sub-N. Mulroe (1pt) for M McGrath. Perhaps, more surprisingly of all, is that in their great year of 2010 when they captured the Moclair Cup for the first time, they suffered a heavy defeat in the Kelly Cup final losing to Burrishoole by 4gls.12pts to 1gl.8pts. And so to their last Kelly Cup title when in 2014 they defeated Castlebar Mitchels by three points, 9pts to 6pts, the same result and same margin as when these two great rivals met in the county senior final that year. Their Kelly Cup team of 2014 was:- Brendan Walsh, D Larkin, Paul Earley, Brian Murphy, Myles Kelly, Danny Geraghty, Joe Geraghty, Dean Gavin, Michael Hoban, Brian Walsh (0.1pt). Ray Geraghty (0.3pts), Damian Coleman(capt), Daire Summerville, Stephen Broderick, Alan Plunkett. Subs- Gary Dillon for Dean Gavin. John Duffy for Brian Walsh. Stephen Finnerty for Michael Hoban (Black card). Q? – Was this the first black card issued in the Kelly Cup ?.